Growth is always triggered through discoveries. Everyday new things are being discovered around the world. Some of these things tends to make life easier and enjoying for all of us. Recently Facebook discovered and same time implemented in their social media, how to skip to the interesting and exciting part while watching live videos, instead of burning megabytes watching for long. isn't it awesome? "right to the point which happened to be the most interesting or engaging part of the video"
This very engagement graph will only pop up or display the very time you start watching a pervious live video. 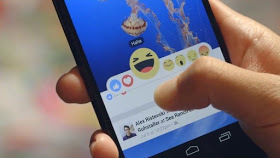 To add to this, Facebook will also come up with a replying reactions during watching previously live video. The very function of this replaying reactions feature, is to enable users to see other people's comment and reactions while watching the live video. Don't be flabbergasted to what this new feature can do, you might see a profile picture of your friend displaying or just pop-up when you replay a previously watched live video. This could be as a result of some recorded reactions he/she made during the course of watching the live video on Facebook. So, anytime you wish to watch, probably a previously live video on Facebook, just check the engagement graph and there you will see the points where the live video has its interesting part. This should save your time from watching the non-interesting part,that at times get someone bored and week. Let your friends know about this development on Facebook social media, by just sharing with the below buttons.